So-called free trade isn’t fair. It’s a license for corporate predators to plunder, exploit, pollute, and operate unrestrained – solely for maximum profit-making. Generation-ago NAFTA promises, touted by the Clinton co-presidency, were Big Lies – well known at the time. Yet the deal was consummated anyway. US trade deals and related bipartisan policies exclusively serve corporate interests at the expense of ecosanity and worker pay, benefits and other rights – millions of manufacturing and other jobs lost since the 1990s. On Monday, Trump touted the new US/Mexico trade deal, talks with Canada to join it continuing. The new “United States-Mexico Trade Agreement” is just the opposite. All US trade deals are secretly negotiated behind closed doors, corporate interests having final say over what’s agreed on, assuring they’re granted new powers and privileges. They make it easier for them to offshore jobs, ignore ecosanity, trash worker rights, and abandon policies vital for human health and well-being. NAFTA’s investor protections incentivize offshoring production and jobs. Since taking effect on January 1, 1994, around a million US jobs were lost from this deal alone. Wages were lowered, benefits lost, and inequality increased at the expense of fast eroding social justice. So-called Trade Adjustment Assistance (TAA) facilitates offshoring of jobs to low-wage countries. The so-called investor-state dispute settlement (ISDS) system grants corporate predators the right to sue governments for virtually unlimited compensation before a rigged panel of three corporate lawyers – their ruling final, not subject to appeal. Rulings in their favor can be gotten by claiming laws protecting public health or ecosanity violate their trade agreement rights. If a nation refuses to pay, its assets can be seized for compensation. ISDS incentivizes offshoring of jobs by providing special privileges and rights for firms relocating operations abroad – facilitating a global race to the bottom. 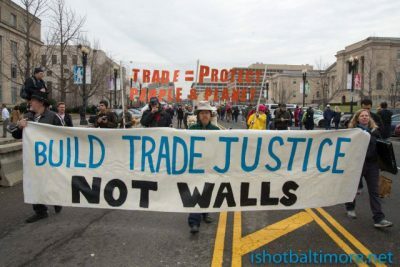 Most NAFTA provisions have nothing to do with trade – everything to do with compromising ecosanity and worker rights, along with human health and welfare. The new US-Mexico trade agreement (NAFTA by another name) empowers corporations to continue offshoring jobs. It lets them ignore ecosanity, human health and welfare in both countries. It trashes worker rights, sub-poverty wages in Mexico as low or lower than in China, America heading in the same direction. Eliminate the Investor-State Dispute Settlement (ISDS) system and the special investor protections it enforces that make it less risky and cheaper to outsource jobs, and that also empower corporations to attack environmental and health laws before tribunals of three corporate lawyers and get unlimited payouts of our tax dollars. Large-scale migration from Mexico to America since the 1990s was largely because US-subsidized agricultural exports under NAFTA displaced millions of Mexican farmers and related workers. The deal also let large US manufacturers and retailers operate freely in Mexico, bankrupting its small companies. Large corporations in both countries benefitted at the expense of everyone else. Once full details of the new US-Mexico trade deal are known, it may show what was agreed on is worse than NAFTA.